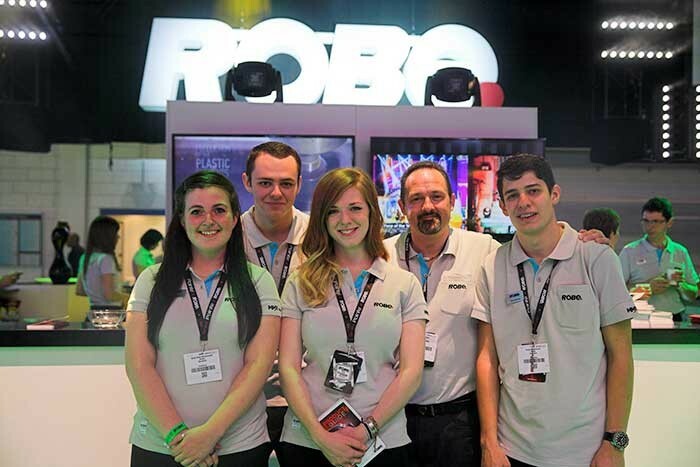 For the second year Robe lighting was joined on its busy stand at the PLASA 2013 exhibition at ExCeL London by students from the BSc Honours courses in Lighting Design and Technology and Live Event Technology at the University of South Wales in Glamorgan. The Robe student ‘PLASA experience’ scheme was initiated last year by Ian W Brown, sales manager from Robe UK in conjunction with Stuart Green, course leader from Prifysgol De Cymru (University of South Wales). It is designed to give successful applicants a taste of the high-pressure, rough-and-tumble world of trade shows and first-hand experience of this lighting industry element. The four lucky 2013 students - Owain Jones, Heather Kirby, Greg Westwood and Beth Mae MacDonald - were selected after submitting a CV and engaging in a phone interview with Ian who comments: “They were all really high calibre.” Having spent a fair time at the University of South Wales, he is generally most impressed with the attitude and aptitude of students and graduates from these courses. He looked for individuals with initiative, personality and a real energy and enthusiasm for the industry. “Working with Robe at PLASA is one of the greatest ‘baptisms of fire’ that anyone can have to the trade show environment and it’s also an ideal opportunity for them to meet people and learn the art of networking as well as becoming more familiar with the products and our company,” he explains. Prior to that, all four were among a party of students from the University who visited the Robe factory in Valašské Meziříčí earlier in the year where they were able to meet key personnel involved in the manufacturing process and see how it all happens, as well as enjoy Robe’s renowned hospitality. Once on the PLASA booth, the students were fully briefed on all the new products and proved to be an essential first point of contact for numerous visitors and invaluable members of the Robe team. With the booth being completely rammed with people from opening to closing every day of the show, the activity was non-stop. All four students came out of PLASA having gained valuable experience, increased their knowledge and dramatically boosted their confidence levels as well as making many new contacts. For Heather who is on the lighting design course, working with Robe at PLASA was a fantastic all-round experience which she really appreciates. “The people are really friendly and made me feel immediately at home … and it’s been amazing all round!” she declares. Stuart Green highlights that working with a globally successful brand like Robe offers a platform and opportunity that they would not normally have and also gives them a greater understanding and appreciation of the technology and thinking behind the products. “The support from Robe and Ian is fantastic”. Ian concludes: “For us it’s great to be able to offer potential professionals of the future a chance to increase their knowledge and experience in a real environment and hopefully encourage them all to move forward with their careers”. In picture: Beth Mae MacDonald, Owain Jones, Heather Kirby, Ian W Brown from Robe UK and Greg Westwood.